Naples, Italy, is the city where pizza and Eggplant Parmesan originated. Naples is also a good city for fresh seafood and you'll find good in-season vegetables in many restaurants. 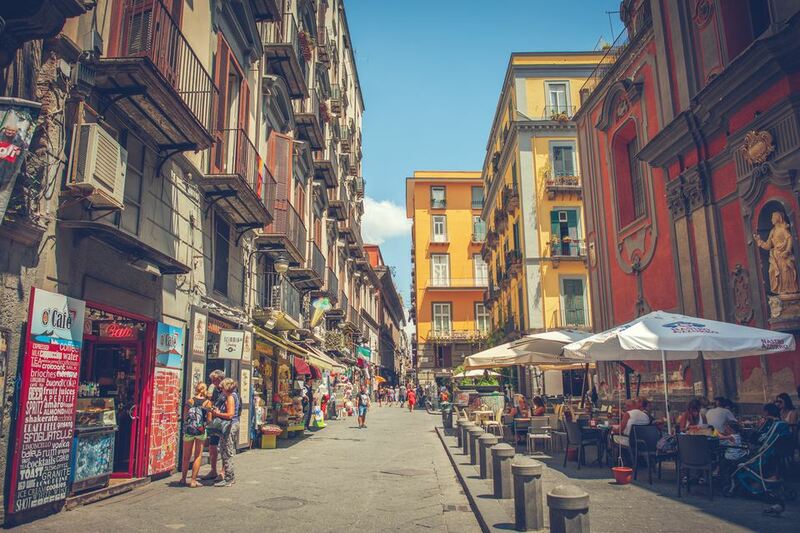 Here are recommended places to eat typical Neapolitan food and pizza in the historic center of Naples. L'Europeo Di Mattozzi is a lively moderately-priced restaurant that serves typical Neapolitan food and pizza. You'll find lots of good appetizers, typical pasta dishes, great seafood and meats. Open Monday through Saturday for lunch and Thursday through Saturday for dinner. Closed from August 15-31 and on Saturdays in July. Campinella is a typical inexpensive trattoria in the heart of the historic center on Via Tiburnali. The menu (in Italian only) is written on a board at the back of the restaurant. You'll find a simply prepared octopus (pulpo) appetizer and a very good spaghetti with seafood (frutti di mare). Portions are small enough (and affordable enough) that you can comfortably eat more than one course. The house wine is pretty good and they also have an assortment of wines by the bottle. Via dei Tribunali 47, open for lunch Wednesday through Monday and dinner Wednesday through Saturday. Da Michele, making pizza since 1870, is claimed by many to be the best pizza in Naples and is the one in the book "Eat, Pray, Love" (compare prices). Although the crust seemed too soft, the sauces were very tasty. They serve only two kinds of pizza - Margherita (said to be the original pizza made for Queen Margarita) and Marinara (without Mozzarella but with lots of garlic and oregano). It's also very economical. See a photo of the pizza on Europe Travel. Da Michele is a little outside the historic center on Via Colletta (about halfway between Via Duomo and the train station), just off Corso Umberto. When you arrive, go inside to get a number; on a Sunday afternoon, you might wait half an hour. This small family-run cantina is a good place for an inexpensive lunch of typical Neapolitan food. Some specialties to try are the excellent melanzane alla Parmigiana (eggplant Parmesan) and the meatballs. They have a good selection of in-season vegetables (verdure) and you can ask for a mixed plate or go up to the counter where they're on display and point to the ones you want. Via Sapienza 40/41. Recommended by Fiorella Squillante, docent for Context Travel Naples Walking Tours. This one is the closest choice for the Naples Archeology Museum. Take Via Santa Maria di Constantinapoli and turn left on Via Sapienza. Taverna dell'Arte is a little more upscale (and costly) than the others in this list but is also a good place to try typical Neapolitan dishes. Try the fresh pasta with calamari, tomatoes, and olives. Open for dinner only, Monday through Saturday, 8pm to midnight. Rampe San Giovanni Maggiore 1a, off Via Mezzocannone; go up the stairs where you see the Taverna dell'Arte sign. The Sorbillo family has three pizzerias on Via Tribunali (between Via Nilo and the Church of Santa Maria del Purgatorio). There is inexpensive wood-oven pizza and the menu lists many choices for pizza toppings. Have a bottle of wine but the downside is that they only have plastic cups for drinking it. Di Matteo Pizzeria, on Via dei Tribunali between Via San Gregorio Armeno and Via Duomo, is recommended by several people though it can be very crowded. There's a small seating area downstairs where they also sell pizza to go and another dining room upstairs. If you're looking for vegan or vegetarian, check out Un Sorriso Integrale, whose sign says, "an Italian Organic Vegetarian Vegan Restaurant." Vegetarian items are pretty common in most Naples restaurants but vegan may be a little harder to find. Un Sorriso Integrale is near Piazza Bellini at Vico S Pietro a Maiella, 6, near Dante metro stop. Open daily, 12-4 and 6:30 - 1 but on weekends you need to call in advance, +39 081 455 026.